Start with a core of great basic pieces, that can be used for any holiday or celebration throughout the year. We love neutral china (nothing beats white! 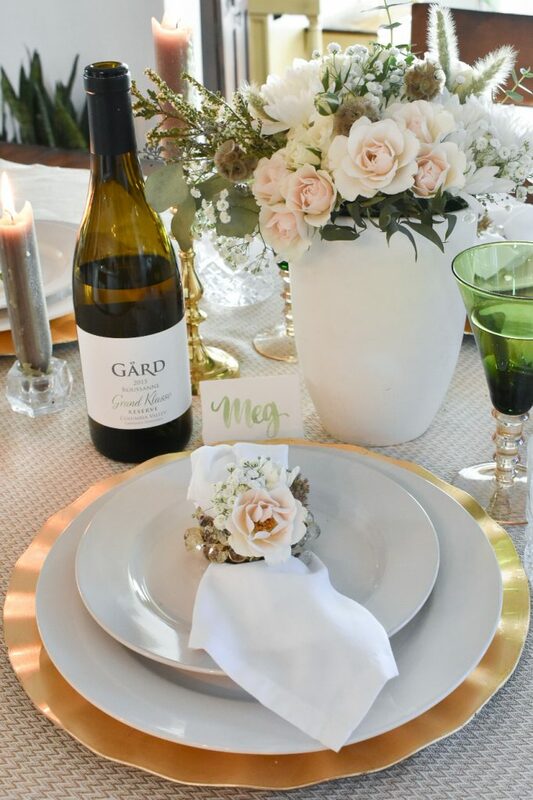 ), crystal (or inexpensive cut glass) water glasses or goblets, and a consistent metallic throughout the table setting (we recommend sticking with either gold tones or silver tones, but don’t be afraid to get creative and mix them up). If you don’t already have these in your collection, start by checking out thrift and antique shops, or your local buy and trade pages online. Look for classics like brass or silver candlesticks, sparkly napkin holders, cloth or linen napkins, and metallic chargers. Next, jazz up your basic table setting with holiday-specific botanicals or décor items for extra oomph! Think miniature pumpkins and dried fall leaves for Thanksgiving, and sprigs of evergreen with red berries for Christmas. The same basic setup will look fresh again in the spring with pastel floral arrangements and decorative eggs. Mix and match textures and colors, or even vintage and modern pieces! In our centerpiece arrangement, we used a combination of fresh and dried florals and greenery. Timeless cut crystal water glasses look elegant next to bold colored wine glasses with a modern silhouette. Cloth napkins are an inexpensive way to add variety to your holiday place settings. We chose white for this non-specific holiday table, but this is a great place to showcase colors or patterns that are more representative of the holiday or event you are celebrating! Thrift and repurpose – be creative! A beautiful table doesn’t have to be expensive. We made arrangements from grocery store clearance bucket florals, combined with dried botanicals that we pulled from an arrangement we already had. A hand-loomed Turkish towel doubles as a tablecloth and adds another layer of texture. Make it personal for a special touch. Consider pulling out those heirloom serving pieces that are collecting dust in a closet – you know Aunt Pearl would love to see Grandma’s platter on the table! Pour a local wine to introduce out of town friends and family to the bounty of our valley (consider having the bottle engraved to commemorate the occasion!). Small nosegays tucked into the napkin rings double as favors for your guests. And as a final personal touch, hand-lettered place cards allow you to seat people strategically to avoid those heated political debates around the table!